NEW YORK, Oct 15 (IPS) - Of the world's 2.3 billion children 14 percent - or 320 million - are living in single-parent households, most often headed by single mothers. Those children aged 0 to 17 years and their single mothers and single fathers face special challenges, including economic hardships, social stigma and personal difficulties, that require society's attention and assistance. While raising children is a major responsibility and protracted undertaking for couples, it becomes markedly more demanding and often onerous for lone parents. Children raised in single-parent households generally do not have the same financial means, personal care and parental support available to them as those brought up in two-parent families. Consequently, children in single-parent families are frequently disadvantaged due to comparatively high levels of unemployment, poverty and poor health among such households. The primary cause of single-parent households in the distant past was parental death due to disease, war, maternal mortality and accidents. As a result of those high adult mortality rates, it is estimated that at least one-third of the children had lost a parent during childhood. Today in addition to parental death, which fortunately has declined markedly over the past century, socio-cultural factors have arisen as the primary causes for single-parent households. Divorce, separation and abandonment are now major reasons for single-parent families globally. In addition, unplanned pregnancy, intended pregnancy and adoption by those who are unmarried and without partners are among the causes of single-parent households in many Western societies. The proportion of children living in single-parent households varies considerably across countries. At the lowest levels where 10 percent or less of the children live in single-parent families are three dozen mainly developing countries, including China, India, Indonesia, Israel, Jordan and Turkey. However, due to their large population size, those countries together account for close to one-third of all children living in single-parent households worldwide (Figure 1). Source: Author's estimates based on national and international statistical sources, including UN, UNICEF, OECD, DHS and World Bank. At the other end of the spectrum with more than 25 percent of the children living in single-parent households are also close to three dozen countries, all of which are developing nations except for Latvia (31 percent) and the United States (28 percent). A particularly high level of single-parent families is in South Africa where close to 40 percent of the children live with their mothers only and about 4 percent live with their fathers only. 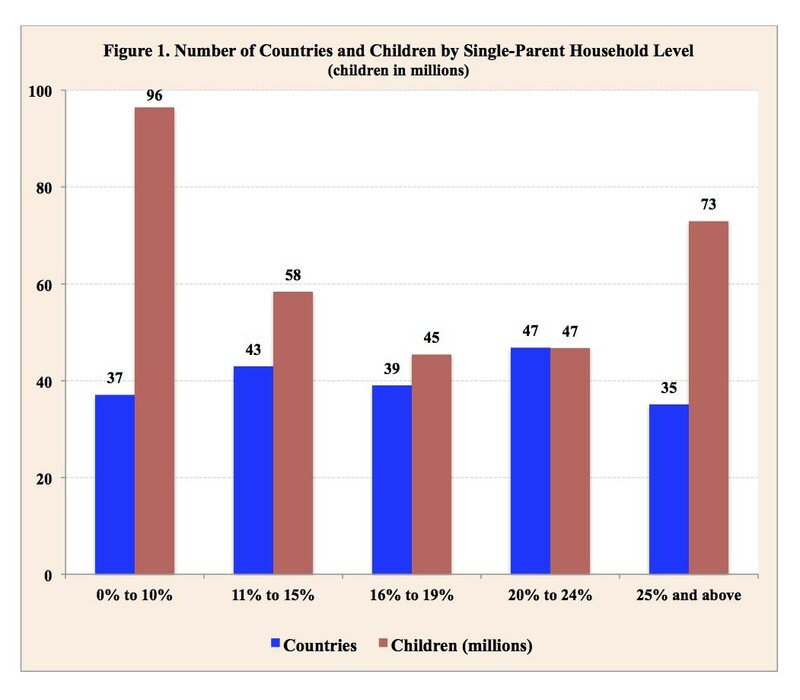 Other countries with high levels of children in single-parent households include Mozambique (36 percent), Dominican Republic (35 percent), Liberia (31 percent) and Kenya (30 percent). Together the high level countries account for approximately one-quarter of all children living in single-parent households. The levels for the remaining 129 countries fall between 11 to 24 percent of children living in single-parent households. Most OECD countries fall within this range, with Austria, Belgium, Canada, Denmark, France, New Zealand and the United Kingdom having no less than one-fifth of their children living with a single parent, again typically a lone mother. Over the recent past the incidence of single-parent families has by and large increased worldwide, with the largest increases occurring in industrialized countries. 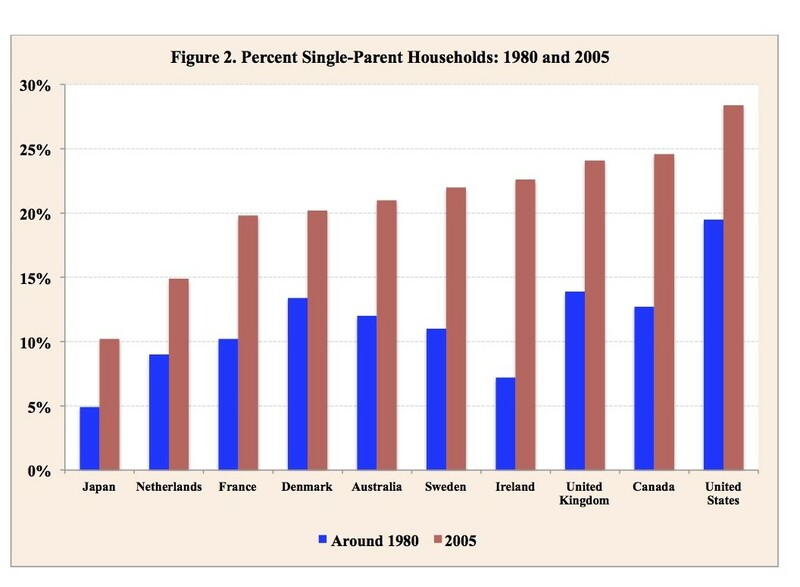 Between 1980 and 2005, for example, the proportion of single-parent households doubled for many developed countries, including France, Japan, Sweden, the United Kingdom and the United States (Figure 2). During the last few years, however, the levels of single-parent households have generally stabilized and some have even declined slightly. In virtually every country most single-parent households consist of mothers and their children. Lone mothers typically head more than 80 percent of single-parent households. Besides fathers abandoning or separating from their families, divorce courts generally award child custody, especially young children, to the divorced mother. In addition to differences across countries, the levels of single-parent households may vary considerably within countries. In the United States, for example, significant differences exist among the major ethnic groups. 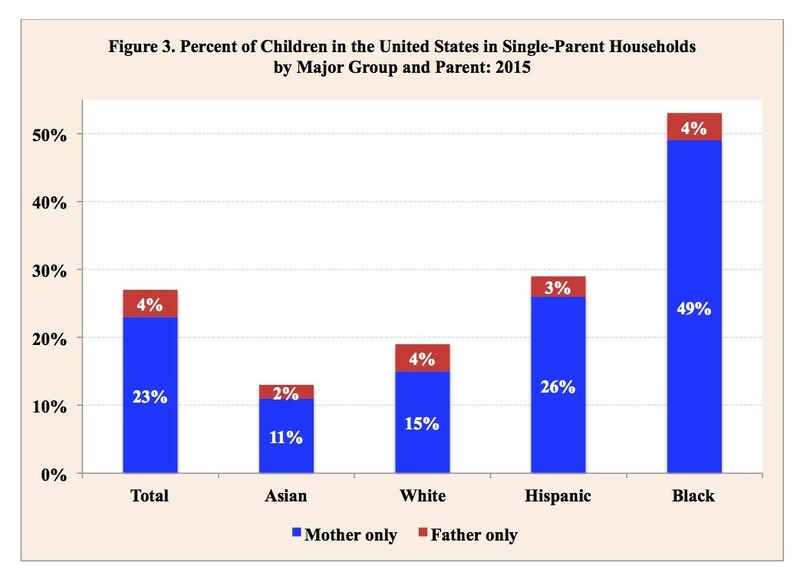 Whereas the proportion of children in the US living in single-parent households is 13 percent for Asians and 19 percent for non-Hispanic Whites, the proportion for Hispanics and Blacks is 29 percent and 53 percent, respectively (Figure 3). Similar large differences in the proportion of single-parent households are observed among major ethnic groups in the United Kingdom, with Caribbean and African families having approximately triple the levels of Asian families. F Source: US Census Bureau. While parental death continues to be an important cause of single-parent households, especially among high-mortality countries, most single-parent families are the result of divorce, separation and abandonment, which have increased markedly over the past half-century. Also, the increasing incidence of cohabitation and non-marital childbearing particularly noteworthy in most Western countries has made breakups, separations and abandonments easier, generally placing them outside normal channels of legal recourse and state jurisdiction. Consequently, cohabiting family households are disrupted or dissolved more frequently than married family households. The regions where children are least likely to be reared in single-parent households are Asia and the Middle East, where cohabitation and non-marital childbearing are rare. For example, less than 1 percent of children are born out of wedlock in China, Egypt, India and Indonesia and Saudi Arabia. The highest rates of non-marital childbearing occur in Latin America, including Columbia (74 percent), Peru (69 percent) and Chile (68 percent). Other countries outside that region with high rates of non-marital childbearing are Iceland (68 percent), South Africa (59 percent), France (56 percent), Sweden (55 percent) and the United States (40 percent). It is important to note that a woman having a non-marital birth does not necessarily translate into a single-parent household. Often non-marital births occur to cohabiting couples. In Denmark, Norway, Sweden and the United States, for example, more than half of non-marital births are to women in cohabiting relationships. Although relatively small, growing numbers of women in developed countries, especially those who are professional and older, are becoming single mothers by choice. Concerned about their reproductive clock ticking and the lack of a suitable partner, some of those single women have turned to sperm donors in order to have a baby and establish a family. Other single women, and to a lesser extent single men, are increasingly choosing to adopt and raise a child in a one-parent household. In the United Kingdom 10 percent of all adoptions between 2012 and 2013 were done by single persons. Also in the United States it estimated that in the last few years approximately 25 percent of special needs adoption and 5 percent of adoptions were by single parents. Again, it is important to note that a child adopted by a single parent is likely to be better off than not having been adopted at all. Marriage, the relationships of couples and childbearing are widely recognized as private matters for individuals to decide and manage largely on their own. However, considerable research finds that not all family structures produce equally beneficial outcomes for children. In addition, the growth of families with a single parent has important economic, social and political consequences for societies. Children brought up in single-parent households typically do not have the same economic, social and human resources available to them as children reared in two-parent families. Consequently, children in single-parent families are generally more likely to experience poverty, drop out of school and have social, emotional and behavioral difficulties than those in two-parent families. Worldwide nearly one in every seven children under age 18 years - or 320 million children - is living in a single-parent household, mostly in mother-only families. Governments and civil society need to adopt policies and establish programs providing the necessary assistance, support and opportunities to ensure that children in single-parent families are not penalized or disadvantaged, but can lead lives permitting them to develop successfully to their full potential, and thereby contribute meaningfully to overall societal wellbeing.